The Bulgarian tourism board participates at the Moscow tourism fair. The ministry of economy, energetics and tourism works on the presentation of Bulgaria at the 18th international tourism fair Ski& Board Salon 2011 until 23 October in Moscow. 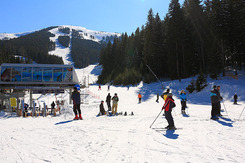 During the past few years, Bulgaria proved to be a high quality winter destination. Over 200 touroperators and agencies, distributors of popular sport trademarks and ski resorts will participate in the event.